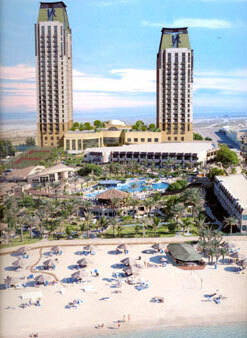 The 'Touch of Arabia' is ever-present in the Habtoor Grand Resort & Spa in Dubai . The luxurious five-star hotel exudes an overwhelming sense of Arabian hospitality - an embodiment of the warmth of contemporary Dubai and the levels of service associated with Habtoor Hotels. Comprising 442 rooms and suites, Habtoor Grand Resort & Spa is a luxurious five-star destination in an unrivalled setting. All the spacious guest rooms have sea-facing aspects or overlook the landscaped gardens. Beautifully furnished, the rooms and suites feature comfortable lounge areas and superb bathrooms, creating a sense of tasteful luxury and warm Arabian style. All Grand Club Suites are lavishly proportioned and enjoy magnificent views towards the beach and marina. Each suite features a separate lounge area and capacious bathroom. The Presidential, Royal and Penthouse suites feature space and facilities befitting their stature. Large terraces are ideal for entertaining, with views that extend across the azure Gulf. Habtoor Grand Resort & Spa features Elixir - a health and fitness facility in which to indulge the senses and invigorate the body. The Dubai Spa Elixir is a richly designed sanctuary in which guests enjoy treatments from around the world. Individual treatment rooms offer holistic care and wellness therapies. For the novice and the enthusiast, Elixir offers the latest in fitness equipment to suit all needs. With personal trainers on hand, a programme can be tailored to exact requirements during a guest's stay at Habtoor Grand Resort & Spa. Stay in one of the hotels in Dubai or in the United Arab Emirates and choose your hotel or resort. Reserve now we offer at the lowest price. Worldwide search for Hotels, Beach Resorts, Beach Bungalows and Villas with our wide selection of accommodations available to meet your budget and purpose, whether it is for your leisure or business.